🚨TRADE ALERT🚨: #NERevs have traded midfielder Lee Nguyen to @LAFC for up to 950k in allocation money. Benny Feilhaber is a quality #10, who’s enjoyed a stellar career in MLS. Feilhaber has been incredibly reliable and durable, having played 30+ games and over 2,200 minutes each year from 2014-2017. And he continues to age like a fine wine in 2018, where he’s already contributed two goals and an assist in just 622 minutes. But at 33 years old, you have to think that Bradley will want to save his legs a bit. Enter Lee Nguyen. Nguyen is two years younger than ol’ Benny and has also enjoyed a very productive and reliable career in MLS, having played 2,500+ minutes each season from 2014-2017. Both players play a similar style and do their best work as creative attacking midfielders (though Nguyen can play multiple attacking positions - more on that later) and in terms of like-for-like subs, Bradley could not have found a better pairing. Note that ASA only counts primary assists in their calculations. We have standards. Right now, Bradley could easily continue starting Feilhaber and then sub on Nguyen at the 60 minute mark and his squad wouldn't lose a step on the offensive side (or he could do the opposite and start Nguyen). We will most likely see LAFC utilize Nguyen in this manner for the next few weeks as he acclimates himself with his new team and works to get his fitness up. Or… things could get tasty for us. Following on a @nacion report, an LAFC spokesman confirms to me that Marco Ureña will indeed have facial surgery for an injury suffered in Sunday's match against Seattle. Timeline for his return not yet clear. Quietly lost in this shuffle was the injury Marco Ureña suffered last weekend. He’s out at least four weeks due to facial fractures and will be evaluated in a month’s time. Ureña’s been used as LAFC’s starting striker, which at the beginning of the season drew eyerolls. What we did not account for was how Bradley would utilize him in a way... I don’t even know what the right term is, but perhaps “holding striker” is the closest position. Below are some quick looks at Ureña’s passing and shot charts from the last two games. A circle means a shot, and a square means a pass. Red means it was an incomplete pass or shot off target, green means it was a completed pass or shot on target, yellow means it was a key pass (a pass that led to a shot), and blue means it was an assist on a goal. As you can see, Ureña’s skill set isn’t a prototypical striker. In fact, he’s been acting as a reverse holding midfielder - operating higher up the field and laying passes off for the onrushing attackers in Diego Rossi, Carlos Vela and Latif Blessing. In 2017 for San Jose, Ureña put up 23 key passes in 1812 minutes. 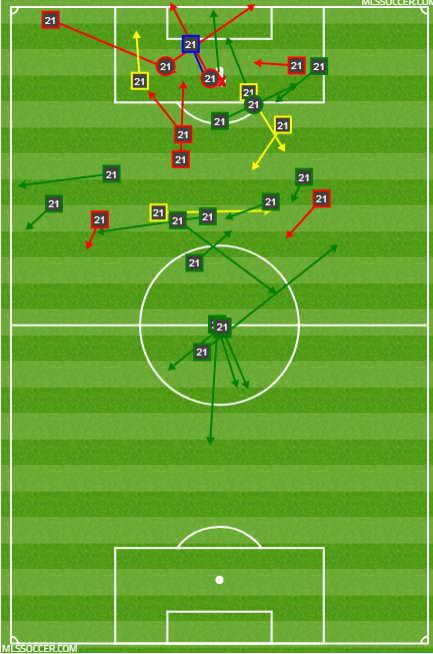 In 2018 for LAFC, Ureña has already put up 22 key passes in just 644 minutes. This is actually where Nguyen, if he’s fit, can really do some fun damage for LAFC’s already explosive attack. LAFC’s lineups in 2018 have certainly varied between some kind of 4-3-3, 4-2-3-1, 3-5-3 formations, but a constant has been Ureña lining up as the central forward. The thought of Nguyen taking on that role tickles me, as the goal scoring burden would be alleviated from Nguyen, but he has the skillset to punish teams if they choose to back off too much. Nguyen, of course, can also compliment the attack by breaking lines and setting his teammates up, much like Ureña’s been doing this year. Will it be down to money though? The only piece of this puzzle that remains unclear is Nguyen’s contract, which for a player of his stature is criminally low at $500k/year. LAFC has to love that contract and may not want to renegotiate either, but should they redo the contract and give Nguyen a pay increase to retain his services for more years, it will release more allocation money to the Revs. It’s also entirely possible Nguyen will just see out his contract and just move to wherever he wants to go (ahem, Dallas please) as a free man. At the very least, he should be much happier playing for Bradley than for Brad Friedel and the Revolution, who treated Nguyen so incredibly poorly during this whole saga.